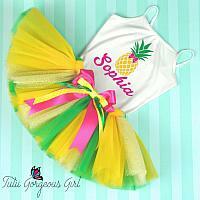 Girls personalized pineapple birthday outfit. 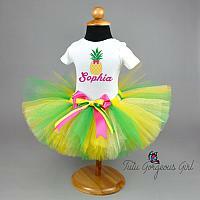 Includes pineapple tutu, pineapple cami shirt with name. This fun personalized pineapple birthday outfit is a perfect choice for your little girl's birthday. 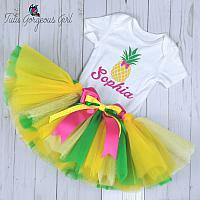 Tutu is made with yellow, green and sparkle gold tulle and includes a hot pink layered bow clip at the waist. The white cami style shirt features a yellow and green pineapple, and hot pink name underneath. Bodysuits are available for newborn to 24 months. Cami style shirts are available for sizes 4T to 14 years. If you would like an adult size shirt please contact us to discuss shirt options and pricing. *8 inch tutu shown in the photos. *Color substitutions are welcome. Please leave your color choices in your order notes.